Many people know I am a MASSIVE Pit-Fighter fan - it's one of my all time favourite arcade games. Most of the home ports are awful and none of them managed to be arcade perfect. It's a shame we never got to see the Atari Panther version, it would have made a great launch game for the Jaguar. Super Nintendo - Utter trash, unplayable mess of a game with no redeeming features. Atari Lynx - Most faithful conversion in terms of graphics as it has all the scaling done in hardware. Speech is missing as are the intro screens but its still a very solid conversion indeed and plays really well. Nintendo Gameboy - Well done for even trying! Considering the hardware this port is really impressive but still not a very good game. Sinclair Spectrum - Another very ambitious port indeed. Ugly as hell except for the intro and faked scaling, which is very impressive, and it plays terribly. It does have possibly the best music of any Speccy game though. Amstrad CPC - Same as the Spectrum version but even worse as it plays in a smaller window. Sega Master System - I don't know how they can even call this Pit-Fighter with those tiny little sprites. Commodore Amiga - Pretty decent, if a bit slow, conversion that is ruined by the controls. You just can't play Pit-Fighter with 1 button, it's impossible as all the computer versions of the game prove. Atari 7800 - Pretty unfair to rate this as its a very early prototype, that said it's still better than the SMS version! Commodore 64 - Kill it! Kill it with fire!!!!! Atari ST - Pretty much identical to the Amiga version. Very nice graphics with faked scaling but ruined by the speed and 1 button controls. Much better music than the Amiga version though as it shares the awesome Spectrum tune. Sega Mega Drive - Saved the best until last, this is an excellent conversion! The only thing it misses is the scaling effects, apart from that it's arcade perfect. Fast, fluid, all the speech, great controls and difficultly levels too! Are you trying to say that you do not like it? I played the Genesis/Mega Drive when it first came out. I agree it is a great conversion. Ugh! Then I traded it off and a few years later came across the Snes version. Not sure what I was thinking. Should have just kept the Sega version. 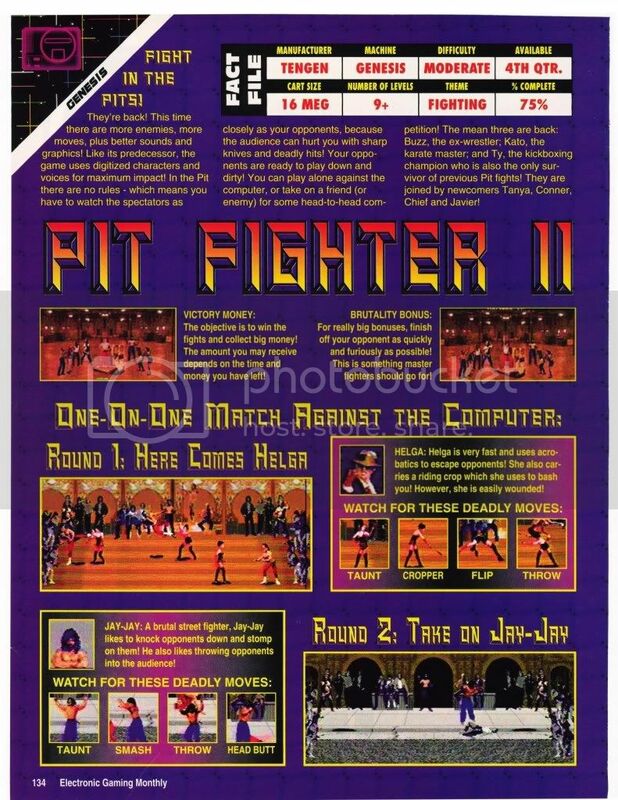 There was actually a Pit-Fighter II announced for the Mega Drive only but it was sadly never released. Another lost game. What where they thinking. Came across this preview of the Game Boy version in C&VG GO! The person who wrote the article was ever excited to see this on the GB. It doesn't look bad but I much prefer the Lynx version. I played the SNES version back in the days but it was so bad I never tried with other ports... I'm sure the GB version is way better. Don't be surprised, my broken English is legendary! The Mega Drive and Lynx versions are by far the best. I loved both the arcade and SMD versions back in the day, lynx version aside I'm glad I didn't have the misfortune to play the other versions. Megadrive version for me on this game.. Love the Lynx version also. TBH I don't think there is actually a good version of pit fighter. I thought the arcade version was a pretty poor game and the home versions just went downhill from there. Did not help that at my local arcade as a kid had the pitfighter arcade surrounded by Golden axe, Simpsons, Xmen, Streetfighter 2, Vendetta, Final fight, wrestlefest etc.